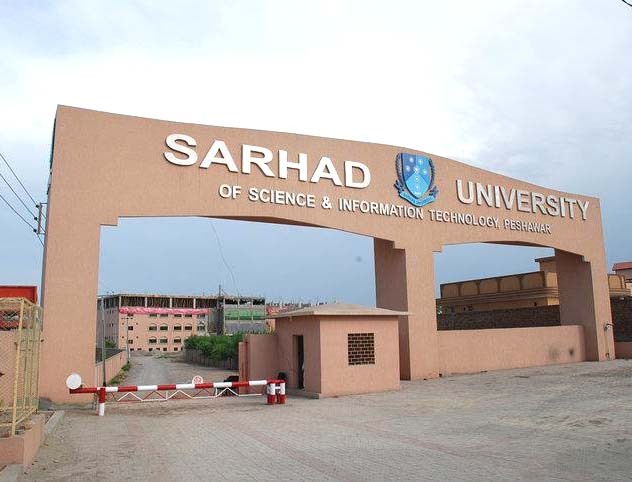 Sarhad University of Science & Information Technology (SUIT), is a leading institute of higher education in Pakistan. it was established in 2001 through an Ordinance of the Government of Khyber Pakhtunkhwa. The University offers a wide range of disciplines in the fields of science, engineering and social sciences. The University is dedicated to imparting high quality education with emphasis on demand-oriented skill-development and training, under excellent conditions of learning. SUIT has strong association with civic engagement and community service. Civic engagement is aimed at serving regional and national areas related with education and economy. It also tries to create homogeneity with all institutions trying to enhance quality of education and transmission of cultural values. SUIT believes in serving the deserving community of the region. For this purpose, volunteers have organized students to donate their blood voluntarily in order to backup-blood donation organizations in the surrounding areas. It creates social awareness among the students to uplift a weak section of the community. The pharmacy department of SUIT provided special services in this blood drive. SUIT is observing social disorder issues in Pakistan. It plays a vital role in uplifting the poor community of the region. Additionally SUIT has set up ‘Fund Raising for IDPs’ (Internally Displaced People). The SUIT administration offers economic support to students who belong to sensitive areas of KPK that have suffered from militant operations in previous years. SUIT’s sport society plays an important role in arranging an annual declamation at the national level with the collaboration of HEC. Mostly invitation is send to the reputed universities and colleges of KPK.Most of the time SUIT has been won the compition.Additionally sport society of SUIT also motivate rest of the universities of the region. At SUIT’s Student Support Department played a vital role to arrange all these activities. Department concentrates on leisure and explores talent of the students by providing ways of sports, cultural and stage performances during each semester. These all events organized by HEC. The government of KPK started an educational project named E-Peshawar. It is aimed at making poor communities of the KPK educationally stable. SUIT’s department of information technology (IT) has taken the initiative to be the very first member of this motivational project. In order to strengthen the access to distance education, Sarhad University uses renowned software for dissemination of information in order to impart knowledge to its distinct students through the internet. Through the platform of distance online education, SUIT’s is providing door to door educational access to the community, through electronic devices such as mobile phones and computer systems. Furthermore, this provides an opportunity to access higher education at an affordable cost.